The RainyDayScience folks got a digital camera from EXO Labs four years ago. While EXO Labs couldn’t make a long term go of it, they did make an excellent product, one which we have used in a variety of projects with great results. We were quite disappointed when we heard about the company, because we continue to use the EXO Focus to this day. 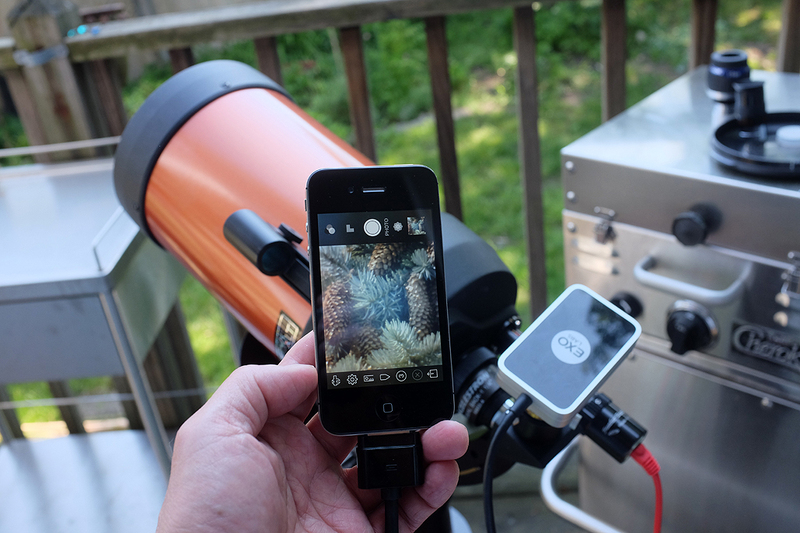 The one thing we haven’t used the camera with yet is a telescope. The EXO Labs camera needed to be within the reach of an AC outlet, and that’s a little difficult out in the field. The interns found a solution to that problem: a rechargeable power packet from Anker. The Anker Astro E3 rechargeable battery has a 10,000 mAh/36 Wh capacity, two USB output ports, and can supply enough current to drive the EXO camera. The folks who designed the EXO imager wanted it to be flexible so they made the mount capable of accommodating a variety of lenses. 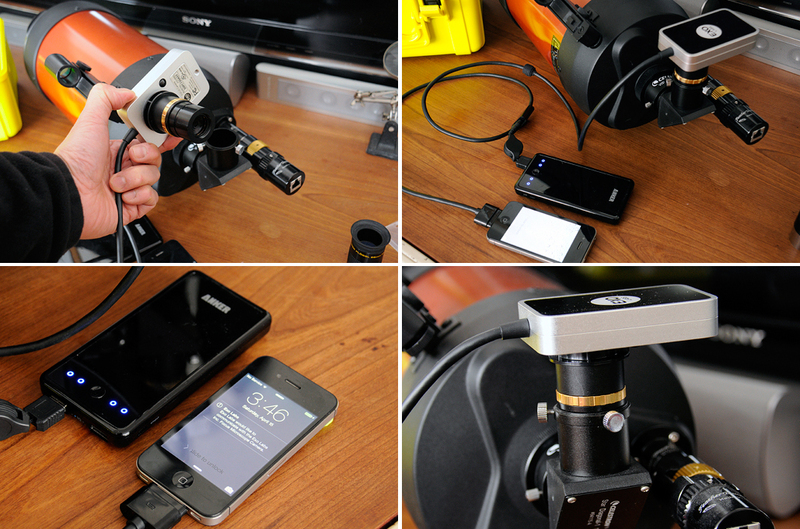 In order to use the EXO Focus with a telescope, we fitted it with the 1.25″ adapter. 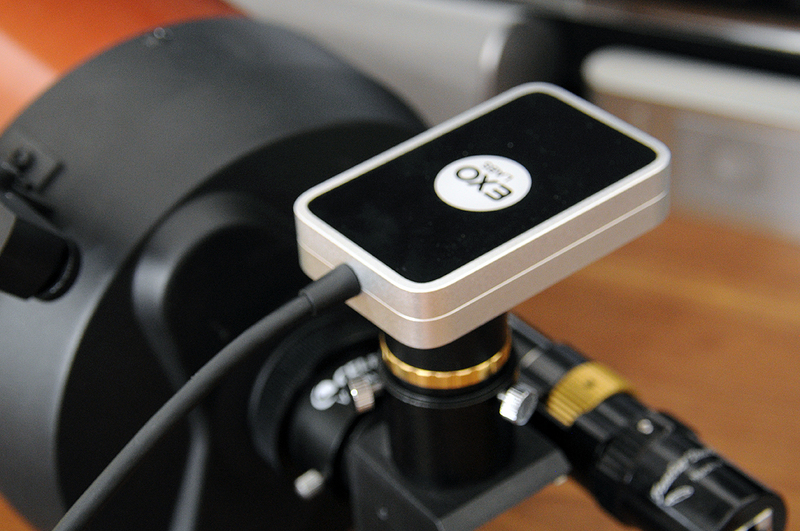 It is sized to fit the standard eyepiece socket of most telescopes. 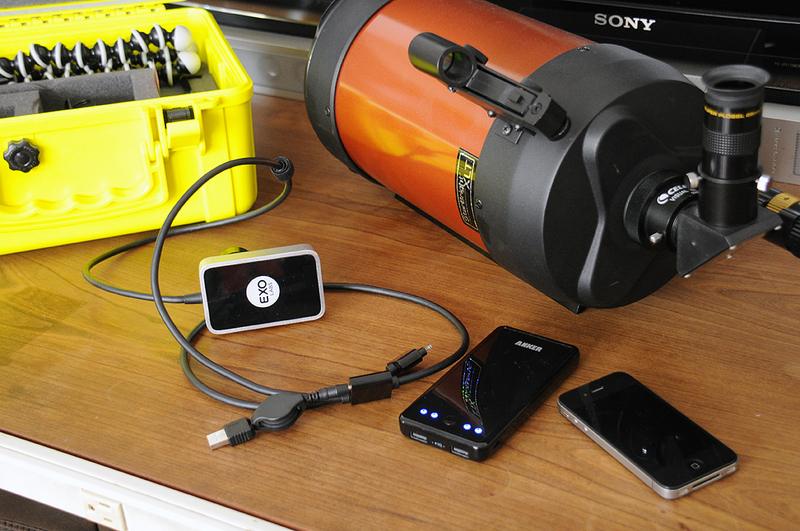 With the AC tether cut, we now have a lot more portability options with our C6 setup. We had wanted to try shooting the full moon as our first test, but not having imaged with the EXO before in this configuration, we thought a daylight trial run was more prudent. For the test we pointed the scope at some tree tops about a 1000 yards away. The live image taken by camera and displayed the on the iPhone screen is not as sharp or contrast-y as that viewed through the eyepiece. Still, the convenience and the ability to share the view with a group is pretty hard to beat! One problem was recognized immediately. Getting the focus properly set using the screen of the iPhone was more difficult than we thought. 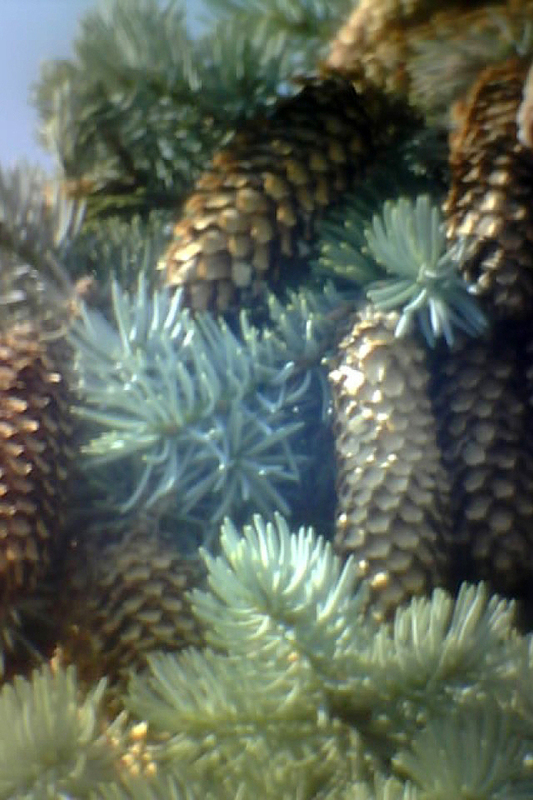 As a result, image taken with the EXO Labs Focus is a little soft in this test. Also, it may be because there was a breeze way up there at the tree top. We think we should be able to do better and will give it another try when we have time. Hi, A friend gave me a ExoLab Focus camera for use on a microscope. Would you have, or know where I could get, the iPhone app? It is no longer at the App Store. Hmmm….that is definitely a problem. We have an old iPhone4 with the app on it running an old version of iOS so we could use the Focus.The app has not been updated to work with the new iOS versions so it won’t run even if you could find it. There are probably some non-Apple approved way of loading an app to an older iphone running an older iOS version, but it would take some effort…bummer, because it is a fun camera to play with!